There are reports that the Palestinian Authority will seek a vote in the Security Council on a resolution mandating Israel’s military withdrawal from Occupied Palestine no later than November 2016. Such a resolution has been condemned by the Israeli Prime Minister as bringing ‘terrorism’ to the outskirts of Tel Aviv, and this will never be allowed to happen. The United States is, as usual, maneuvering in such a way as to avoid seeming an outlier by vetoing such a resolution, even if it has less stringent language, and asks the PA to postpone the vote until after the Israeli elections scheduled for 2015. Embedded in this initiative are various diversionary moves to put the dying Oslo Approach (direct negotiations between Israel and the PA, with the U.S. as the intermediary) on track. The French want a resolution that includes a revival of these currently defunct resolutions, with a mandated goal of achieving a permanent peace within a period of two years based on the establishment of a Palestinian state, immediate full membership of Palestine in the UN, and language objecting to settlement activity as an obstruction to peace. Overall, European governments are exerting pressure to resume direct negotiations, exhibiting their concern about a deteriorating situation on the ground along with a growing hostility to Israeli behavior that has reached new heights since the merciless 51-day onslaught mounted by Israel against Gaza last summer. The horrendous events of the last several months in Jerusalem and Gaza have exhibited both the depths of enmity and tension between Jews and Palestinians and the utter irrelevance of American-led diplomacy as the path to a sustainable peace. This is not a time for people of good will, the UN, and governments to turn their backs on what seems on its surface either irreconcilable or on the verge of an Israeli victory. The challenge for all is to consider anew how these two peoples can manage to live together within the space of historic Palestine. We need fresh thinking that gets away from the sterile binary of one state/two states, and dares to ponder the future with fresh eyes that accept the guidance of a rights based approach shaped by international law. Israel will resist such an approach as long as it can, understanding that it has gained the upper hand by relying on its military prowess and realizing that if international law was allowed to play a role in demarcating the contours of a fair solution it would lose out on such crucial issues as borders, refugees, Jerusalem, settlements, and water. A necessary step toward a sustainable peace is to overcome Washington’s blinkered conception of the conflict. 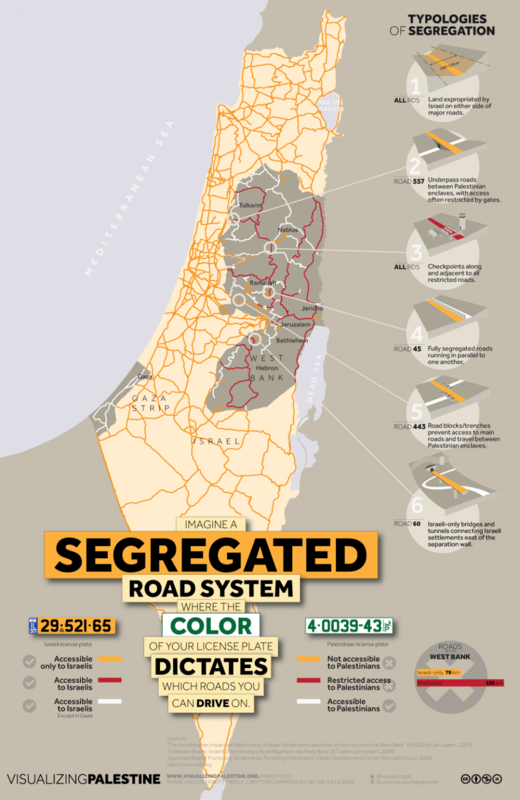 It is worse than futile because Israeli land grabbing on the West Bank in relation to the settlements, the settler only roads, and the separation wall continuously deteriorate Palestinian territorial prospects. The collapse of the Kerry talks between Israel and the Palestinian Authority in April were unquestionably a negative watershed for the Obama presidency so far as its insistence that the Oslo Approach was the only viable roadmap that could resolve the conflict. Ever since the Oslo Declaration of Principles was sanctified by the infamous Rabin-Arafat handshake on the White House lawn in 1993, the U.S. Government has contended that only this diplomatic framework can end the conflict, and to this day it objects to any moves by governments to take steps on their own. 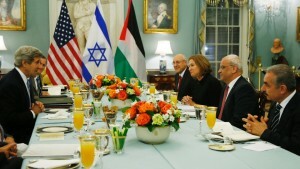 During the presidency of George W. Bush there was an interval during which ‘the roadmap’ was adopted as an elaboration of the Oslo approach in which a commitment to the idea of an independent Palestinian state was explicitly confirmed by Bush in a speech on June 24, 2002, and then formalized in a proposal made public on April 30, 2003; in this same period ‘the quartet’ was created at a Madrid Conference in 2002 that seemed to broaden diplomatic participation by adding the Russia, the EU, and the UN to the U.S., but in fact the quartet has been completely marginalized for the past decade. The Oslo Approach consists of direct negotiations between the parties and designated the United States, despite its undisguised partisan role, as the exclusive and permanent intermediary and go between. Without the slightest deference to Palestinian sensitivities, U.S. presidents have appointed as special envoys to these negotiations only officials with AIPAC credentials such as Dennis Ross and Martin Indyk, and have proceeded as if their blatant partisanship was not a problem. Evidently Israel would have it no other way, and the Palestinian Authority has meekly gone along either out of weakness or naiveté. Not only was the Oslo framework itself flawed because it leaned so far to one side, but it was an unseemly tacit assumption of the process that the Palestinians would be willing to carry on negotiations without reserving a right to complain about the relevance of ongoing Israeli violations of international law, most conspicuously the continued unlawful settlement activity. Palestine’s primary bargaining position and its only advantage in relation to Israel was to have international law in its favor as regards most of the outstanding issues between them. When on several occasions the Palestinians complained that this settlement activity was incompatible with good faith negotiations, they were immediately slapped down, informed that such objections interfered with the peace process, and that issues pertaining to the settlements would be deferred until the ‘final status’ stage of the negotiations. The Palestinians were assured that these issues would be addressed at the very end of the peace process after the main elements of a solution had been agreed upon. This was very detrimental to Palestine’s bargaining position as their only advantage in relation to Israel was to have international law in their favor in relation to most of the outstanding issues. Besides to allow Israel to continue with settlement expansion, rather than freezing the status quo, was obviously disadvantageous to Palestine. If legal objections were excluded it is not surprising that diplomatic bargaining would tend to reflect ‘facts on the ground,’ which were completely in Israel’s favor, and would continue to accumulate month by month. Despite this, Israel at no point seemed responsive to proposals for accommodation in accordance with the stated objective of establishing an independent sovereign Palestinian state. After more than 20 years of futility Washington’s continuing public stand that only by way of the Oslo Approach will a solution be found is beginning to fall on deaf ears, and new directions of approach are beginning to be articulated. Israel itself is moving ineluctably toward a unilaterally imposed one-state solution that incorporates the West Bank in whole or in large part. It has recently seized 1000 acres of strategically placed land to facilitate the largest spatial enlargement of a settlement since the early 1990s and it has given approval for 2,600 additional housing units to be built in various West Bank and East Jerusalem settlements that already have more 650,000 settlers. In addition, the current Israeli president, Reuven Rivlin, elected by the Knesset a few months ago is an avowed advocate of the maximalist version of the Zionist project involving the extension of Israel’s borders to encompass the whole of Palestine as delimited in the British mandate. Rivlin couples this rejection of any Palestinian right of self-determination with proposals for equality of treatment for both peoples within this enlarged Israel, offering the Palestinians human rights, the rule of law, and unrestricted economic and political opportunity within Israel in exchange for renouncing their political ambitions for either a state of their own or a power-sharing arrangement on the basis of equality with Israel. There is no prospect that the Palestinian people, or even their compromised leaders, would accept such a Faustian Bargain. The Palestinians have their own version of a unilateral solution, although it is far more modest, and seems more fantasy than political project. It is essentially establishing a state of their own within 1967 borders, taking an ambiguous posture toward the settlement blocs and even East Jerusalem, and relying on political pressures to coerce an Israeli withdrawal. Such a state claims 22% or less of historic Palestine, and includes the somewhat confusing contention that Palestine is already a state in the eyes of the international community, having been recognized as such by 134 states and in a resolution of the General Assembly on 29 November 2012. It is currently reinforcing this position with this draft resolution that Jordan will submit on its behalf at some point to the Security Council proposing a resumed period of direct negotiations for a further nine months (accompanied by a freeze on settlement construction), followed by Israel’s mandatory withdrawal from the West Bank. On balance, this Palestinian approach seems ill-considered for a number of reasons. It appears to reduce the parameters of the conflict to the occupation of the West Bank, and leaves to one side the fate of Gaza and East Jerusalem, as well as what is to happen to the several million Palestinians living in refugee camps in neighboring countries or in exile. It also overlooks the structure of discrimination embedded in Israeli nationality laws that reduces the 20% Palestinian minority in Israel to a second class status in the self-proclaimed Jewish state. Among the problems with these reactions to the breakdown of Oslo are the contradictory expectations. What the Netanyahu unilateralism is seeking is utterly inconsistent with any kind of viable Palestinian state constructed within the 1967 borders, and those opposition forces to his right are seeking an even more defiant unilateralism. 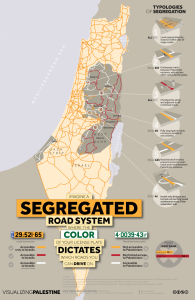 Equally, what the Palestinian Authority is proposing would seem to require the elimination of most Israeli settlements, the dismantling of the security wall, and the abandonment of the Israeli-only network of roads, while ignoring those Palestinian grievances not directly associated with territorial issues. Each of these versions of a post-Oslo solution is doomed to failure as it proceeds as if the behavior of others need not be taken into account. The Israeli failure to do this is far more unacceptable as its claims are far more excessive than those of the Palestinians, which is really just a matter of wishing away the pattern of Israel’s unlawful encroachment on what is a minimalist Palestinian vision of a solution that it and the UN had long ago accepted in Security Council Resolution 242. There is an evident unfortunate reluctance on the part of all sides to let go of the two-state conception of a solution. 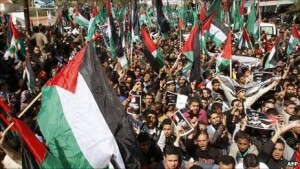 It is what Washington and even Tel Aviv and Ramallah continue to say they seek, although Netanyahu has been telling Israeli audiences that after its experience with Hamas rockets last July and August, it will never agree to allow the emergence of a neighboring Palestinian state in the West Bank that would bring Palestinian threats much closer to the Israeli heartland. The 2002 Arab Peace Initiative is built along the same lines as the PLO proposal, and includes a commitment to establish full diplomatic and economic relations with Israel on the part of the entire Islamic world. 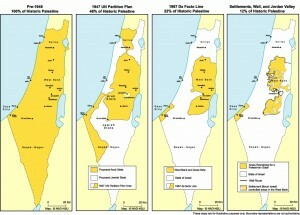 Ever since the 1988 decision of the Palestinian National Council, the PLO has agreed to a solution framed in relation to a state within of its own within the 1967 borders, and even Hamas has signed on since 2006 to the extent of accepting a 50 year plan for peaceful coexistence with Israel providing it ends the occupation of Palestinian territories, and lifts the Gaza blockade. 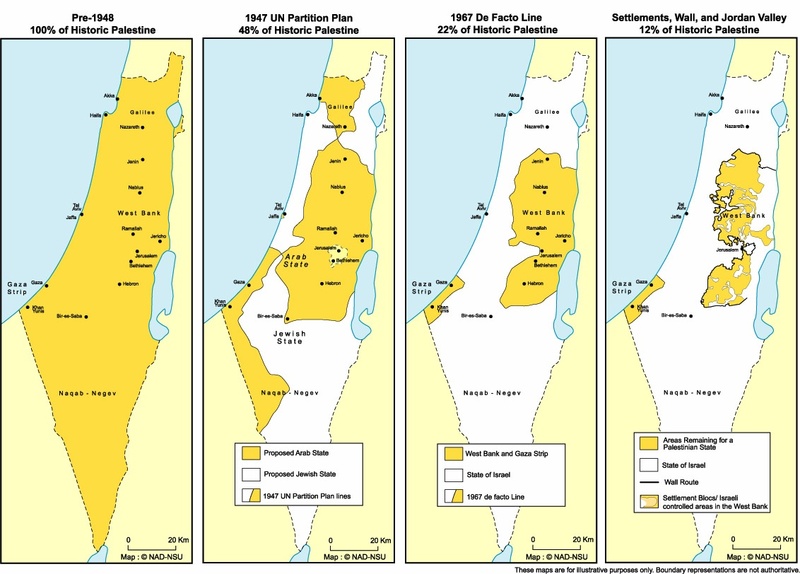 These are big concessions from the Palestinian side considering that the UN Partition Plan of 1947 awarded 45% of historic Palestine to the Palestinians and proposed the internationalization of the entire city of Jerusalem. The 2002 Arab Peace Initiative is built along the same lines as the PLO proposal, and includes a commitment to establish full diplomatic and economic relations with Israel on the part of the entire Islamic world. This proposal of the Arab League by a 56-0 vote of the Islamic Conference, with only Iran abstaining, and a year ago as a result of American pressure was modified to make it even more appealing to Israel by its acknowledgement of Israeli security concerns. Most recently, a letter to Netanyahu by 106 high ranking retired Israeli military and security officials strongly urged this same two-state solution, implicitly condemning Israeli unilateralism and Zionist maximalism as leading to a future for Israel of periodic warfare of the sort that occurred this past summer in Gaza. These members of the Israeli security establishment argue that these expansionist policies are weakening security for the entire Israeli population. The letter emphasized Israel’s moral decline associated with keeping millions of Palestinians under prolonged occupation, which they argue is unnecessary from the perspective of security. Again there is a lack of clarity about whether such encouragement assumes that the settlements can be retained, the rights of Palestinian refugees can be ignored, and Jerusalem can be kept under unified Israel control. Europe has also, at last, exhibited a limited unwillingness to accept any longer the Oslo Approach that keeps the United States alone in the driver’s seat. I interpret the recent Swedish recognition of Palestinian statehood, the House of Commons vote urging that the British government take a similar move, as well as similar moves by several other European countries as expressing both a loss of confidence in the Oslo Approach and a criticism of the manner in which Israel and the United States have dealt with the conflict. This is a desirable development in these respects, but it is coupled with some regressive features. Such initiatives are coupled with renewed faith in the two-state approach as the only solution, and call with a sense of urgency for a renewal of negotiations without giving the slightest indication as to why a further round of talks would yield any different results than past attempts. Such a prognosis seems more true at present than in the past given Israel’s moves toward a unilateral solution, which Netanyahu somewhat disguises so as not to affront the United States and Europe. It should be obvious to all who wish to look that Israel has created irreversible conditions that have all but ruled out the establishment of a viable Palestinian sovereign state. The expected controversy surrounding the PA initiative in the Security Council is a sideshow without any serious consequences however it is resolved. The best, and in my view, only realistic hope is to forget traditional interstate diplomacy for the present, and understand that the Palestinian future depends on a robust mobilization of global civil society in solidarity with the Palestinian national movement. The current BDS campaign is gaining momentum by the day, and is coupled with a sense that its political program is more in keeping with the wishes of the Palestinian people than are the proposals put forth by the formal representations of either the Palestinian Authority or Hamas. When neither governmental diplomacy nor the UN can produce a satisfactory solution to a conflict that has caused decades of suffering and dispossession, it is past time to endorse a people-oriented approach. When neither governmental diplomacy nor the UN can produce a satisfactory solution to a conflict that has caused decades of suffering and dispossession, it is past time to endorse a people-oriented approach. This is the kind of populist politics that helped end apartheid in South Africa and win many anti-colonial struggles. We have reached a stage in global history in which it is people, not weapons nor international institutions, that have the resilience and patience to win the legitimacy struggle involving law and morality, and on such a basis eventually prevail in the political struggle despite being inferior militarily. The challenge of living together on the basis of equality seems to be the only template that offers the parties a vision of sustainable peace. Concretely, this would seem to require Israel to renounce all ethnocratic claims that Israel is a Jewish state as distinct from being a Jewish homeland. Israel’s leaders would also have to renounce the present unrestricted right of return for Jews throughout the world or create some equivalent right of return for the Palestinians, and possibly for the Druse minority. How such a conception of a sustainable peace is given concrete form is necessarily a subject for diplomacy by suitable representative of both sides and carried on under neutral auspices and by authentic representatives of the two peoples. We cannot foretell how much further suffering and bloodshed will occur before this kind of vision, seemingly a remote prospect at present, can be converted into a practical project, but do know that nothing that falls short of this deserves to be considered ‘a solution’ given the realities of the situation. Until it is realized that USA are hardly more than an Israeli vassal state, there is no prospect of resolving this Palestinian knot.